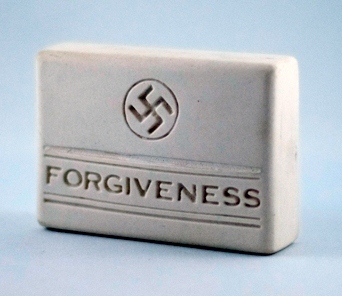 So, Charles Krafft – his Disasterware, including seemingly sardonic anti-Nazi ceramic creations, hailed as iconic for years – is outed as a Holocaust denier. Red faces abound in the art world as the realisation sinks in… the artist intended no irony. The story broke in Jen Grave’s recent article in The Stranger. Krafft seems unconcerned to be exposed – amused even. Perhaps unsurprising, given the truth came from his own vocal online output, where he willingly espoused his white nationalism, including a podcast where he denied the Holocaust in clear terms. The majority surely will find his views unpleasant and, in fact, deeply offensive. But is his career over? Museums say they probably won’t remove his work. Private collectors – some of whom were Jewish, buying into a perceived sympathetic view – may now find themselves in a dilemma: to destroy or not? The fact is, the first interpretations of Krafft’s work – as ironic juxtapositions, a commentary on popular culture – can still be eloquently argued. It is perhaps only the artist himself who has nothing new to say.